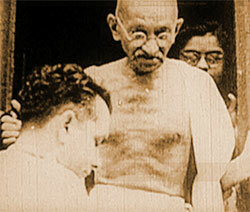 Based upon the one-hour documentaries, "GANDHI'S AWAKENING" and GANDHI'S GIFT." GANDHI’S AWAKENING documents the fascinating story of Mohandas Gandhi’s 21 early transformative years in South Africa, before now known only to scholars. GANDHI’S GIFT chronicles the Master of Nonviolence at the end of his life, 1944-48, on the brink of attaining his lifelong goal of freedom from the British but with his heart breaking by the partition of India and the terrible communal violence that is killing untold thousands. Lesson Plans are written in a standard lesson format, complete with background information, standards and resources. Each lesson incorporates discussion questions and learning activities. An Important Reminder: Preview all online and video content before sharing the content with your students.